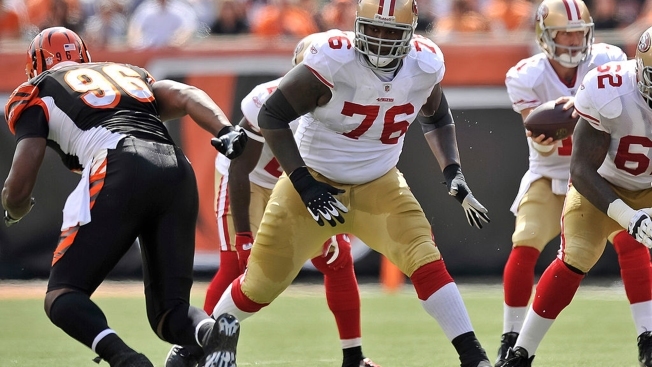 Can Anthony Davis Provide a Boost to 49ers' Offensive Line? In 2015, right offensive tackle was a weak spot for the 49ers. Veteran Erik Pears was often beaten badly in both pass and run blocking, and Trent Brown showed promise in his late-season starts but had the expected growing pains of a rookie. So the news Monday that former 49ers starter Anthony Davis has applied to the NFL for reinstatement after a year of retirement was a welcome development for Niners fans. Davis, after all, was a key part of the offensive front that performed so well during the Jim Harbaugh era. The 6-foot-5, 323-pounder, a first-round pick in the 2010 draft, was a first-rate run blocker during his five seasons as a starter at right tackle. He was a physical, athletic tackle who consistently made big blocks and opened holes for Frank Gore and Co. But how much can Davis give the 49ers in 2016? The answer may be not much. No one really knows what kind of shape Davis is in, and he’ll be coming into camp to play in a new fast-paced spread offense installed by head coach Chip Kelly that will require offensive linemen to be in peak condition. Plus, Davis thrived in the power-blocking scheme in place under Harbaugh, and the new offense uses more of a zone-blocking system. Plus, Davis and general manager Trent Baalke have had their problems, including Davis’ sniping on Twitter about the 49ers. It’s possible that Baalke and the organization -- and possibly some teammates -- might not be comfortable welcoming back a player who walked away unexpectedly in 2015, leaving the team without a solid replacement at his position. There’s no doubt that Davis is a more talented tackle than Pears or Brown, but those skills will be rusty. And if Davis is out of shape, he could struggle big time in training camp, which opens this week. Then again, if Davis comes into camp in decent shape and grasps Kelly’s system, the 49ers could receive a huge boost. An offensive line with Davis at right tackle, rookie Joshua Garnett at right guard, Daniel Kilgore at center, Zane Beadles at left guard and Joe Staley at left tackle would seem significantly better than what the 49ers had in 2015. Steve Busichio of SB Nation wrote Tuesday that the 49ers should welcome Davis back into the fold.